At 9:00 in the morning: Take your baby and your whole family to the nature and have fun! 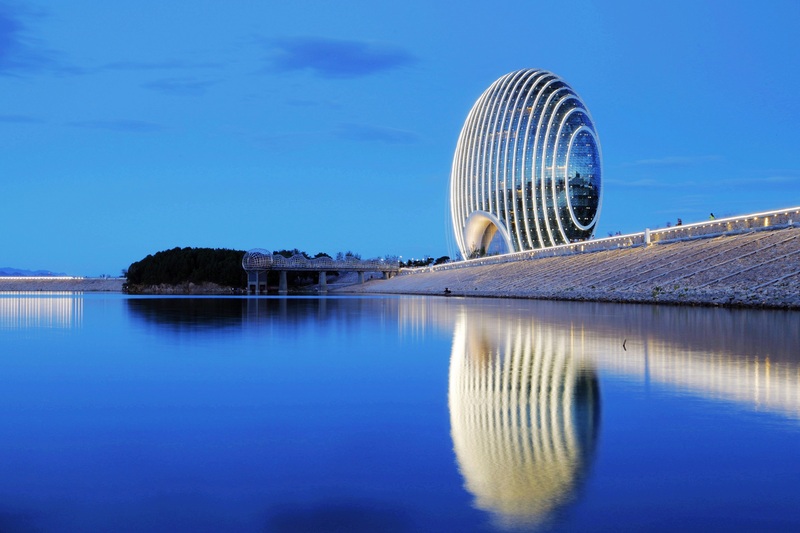 The first stop is at the lake yanxi, often during the spring and autumn every year flocks of geese to the lake habitat, so named. Mountains on three sides by mountains and faces the north ring animation, mountain ranges, the west is a majestic red screw mountain peaks, in one thousand, the monastery of the morning bell and evening drum reminders and lake yanxi natural beauty from afar bring out the best in each other. Gold light mountain and for such as two shinning pearl inlaid in the east of lake yanxi, the top of the mountain there was an old temple - golden light temple, huairou, with the shining under the mountain temple known as the old one of the eight sights - golden light shines. It is said that this was in 2014, the APEC (APEC) meeting, worth to see. At noon, after coming down from the Great Wall, you’ll come to the Burger King at the commercial street, which is always children’s favorite. 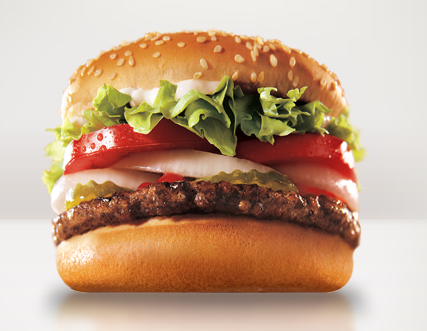 You can try the most classic choice - whopper Burger King, mouthwatering, with nicely grilled aroma, filled with fresh vegetables and good quality meat. After lunch, have a look at the nearby Bohai Village, where the traditional Temple Fair is being held at Chinese New Year. 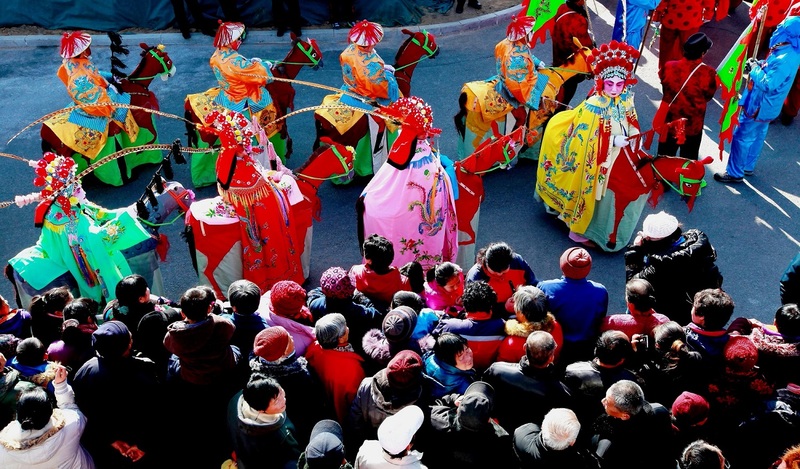 There are many fresh and lively local shows and traditional activities. Enjoy yourselves in the moment! It’s hard to come by in urban life, so especially your children will definitely fancy seeing such a scene, and run to join them. With the baby finally came to the mutian valley Great Wall in the afternoon，because you want to see the magnificent scenery at the Great Wall covered with snow rather than crowds of people lining up like a dragon on the mountain. This is also a good place for babies to learn and gain experiences. You can buy the ticket to the the Mutianyu Great Wall and the cable car tickets in advance on line, and then you can go through the entrance just by scanning the QR code. That’s it! Take a cable car to No. 14 watchtower, and immediately you’ll feel the breeze. Seen from afar, the Great Wall and the mountains are so charming and awesome! 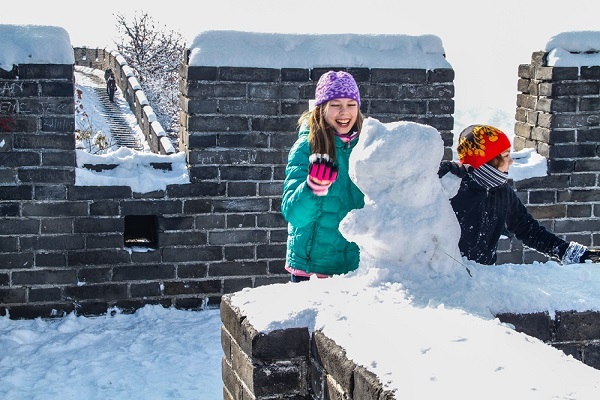 Maybe while you’re admiring the beauty of the Great Wall, your children are already playing snowball games or making snowman with other kids. There seem to be no national boundaries, and only common joy. Having your baby on your shoulders, while holding your beloved one’s hands, let someone take a phone of this great moment of joy and happiness. It’s also a great opportunity to tell your children about Chinese history and traditional culture. In the end, why not try something thrilling to come down on the slide with your family? Around 9:00 in the evening: You can stay at the the Mutianyu Great Wall Boutique Hotel. There are many kinds of rooms, to meet the various groups of people’s preferences. 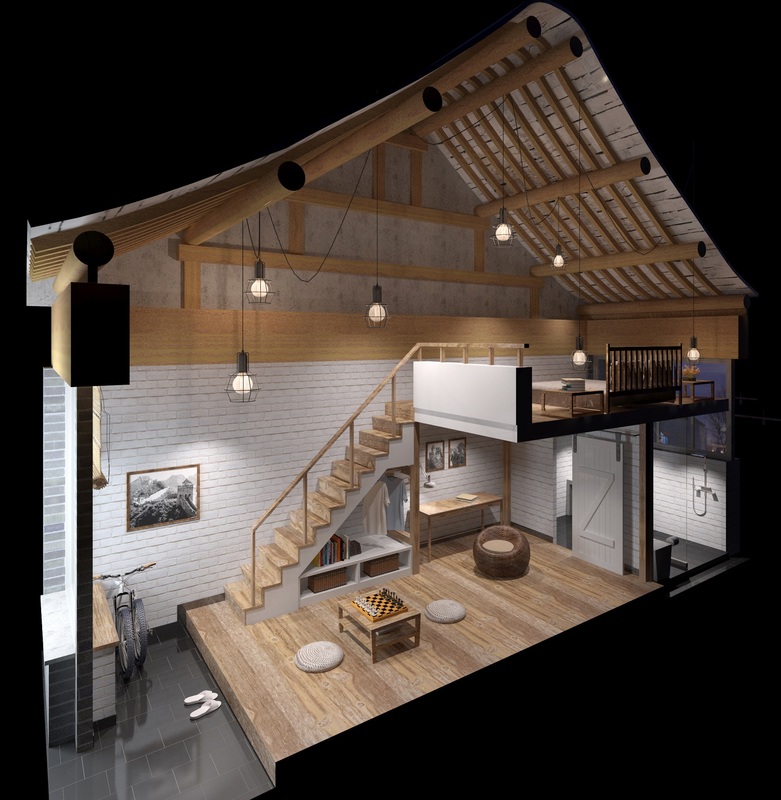 Loft rooms are perfect for families, for children can take the upper floor, and adults can stay on the lower floor. The room is decorated like a cottage in the woods and the lights are like stars in the night. As for dinner, you can order hamburgers and steak to the room for a candlelight dinner, and have a chat with your beloved ones. 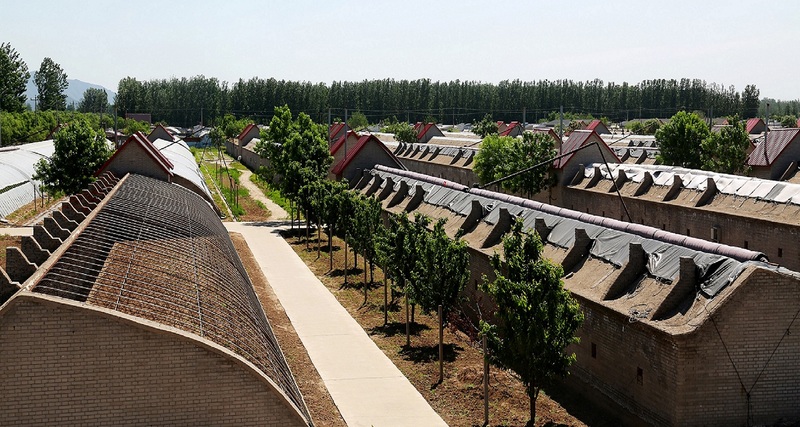 At 2:00 o’clock in the afternoon, you can drive to the Mutianyu organic garden, known as "Back Yard of Beijing”, located in Tai Ping Zhuang village, Huairou District, which is about one hour’s drive from the the Mutianyu Great Wall. In Here, you not only can experience the fun of picking vegetables and enjoy the leisure in the field, but also can get a comprehensive understanding of the production environment and process of organic produce. All the vegetables here are organic without pollution. Besides, you can experience the farming with children, which help improve promote the family bond.